Okay, here we go. We have less then two weeks to go and then it’s EID! The most magical time of the year. 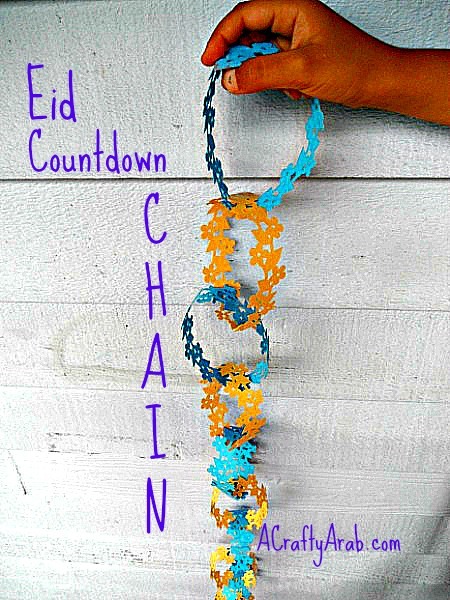 So as we start to think about Eid, today we made a ring chain to help us countdown. I’ve seen some pretty standard looking paper ring chains, but we wanted to make our chain look pretty, so we used the Martha Steward Blossom Trim punch to spice things up. Using your paper slicer, cut the 8 1/2 x 11 cardstock into 1 1/2 inch strips. Put the strips through the edge punch. Using the clear tape, attach the edges to each other to form a ring. Take the next piece of paper, put it through the last strip and attach it until you have the entire chain. Be sure to alternate the colors so that you have a blue chain and then a yellow chain. Hang your chain in the kitchen or someplace that the little ones can get to and break a chain every night until you get to Eid!!! !